ProTx-II (Protoxin-II) is a toxin that was originally isolated from Thrixopelma pruriens (Peruvian green velvet tarantula).ProTx-II inhibits both tetrodotoxin-sensitive and tetrodotoxin-resistant channels. ProTx-II inhibits activation by shifting the voltage-dependence of channel activation to more positive potentials. ProTx-II potently inhibits all sodium channel subtypes tested (Nav1.2/SCN2A, Nav1.5/SCN5A, Nav1.7/SCN9A, and Nav1.8/SCN10A). It is approximately 15-fold more potent on Nav1.7/SCN9A than on Nav1.5/SCN5A channels and acts on Cav3.1/CACNA1G and interacts more weakly with the related T-Type channel Cav3.2/CACNA1H but potently inhibits the L-type calcium channel Cav1.2/CACNA1C. ProTx-II also binds to phospholipids. 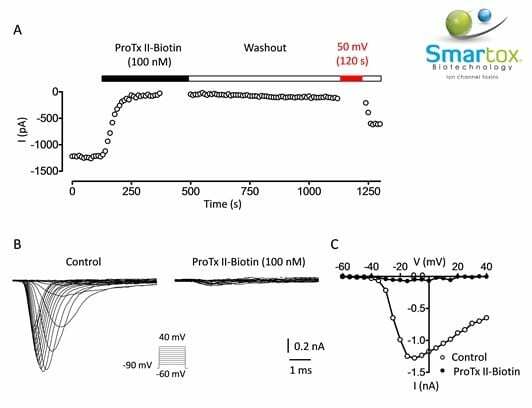 ProTx-II, a selective inhibitor of Nav1.7 sodium channels, blocks action potential propagation in nociceptors. A, Recording traces of transiently-expressed human Nav1.7 current in the presence of ProTx II-Biotin (100 nM). The current was elicited by a 50 ms-depolarizing pulse to -10 mV from a holding potential of -90 mV. Inter-sweep period was 10 s. Current amplitudes were plotted against time. Note that toxin-induced inhibition is resistant to washout, however it can be partially relieved by depolarizing the cell membrane. B, Families of hNav1.7 current traces in control and in the presence of 100 nM ProTx II-Biotin. Currents were evoked by depolarizing pulses from -60 mV to 40 mV, while the cell was hold at -90 mV. C, Amplitude-voltage relationships obtained from B. Product code: N/A. Category: Sodium channels. Tags: Nav1.7, protoxin, prtx, tetrodotoxin, ttx.